Saturday marks a milestone in the fight against HIV/AIDS: the 30th annual World AIDS Day. Since the height of the epidemic in the mid-1980s, the number of people newly infected with HIV has reduced dramatically – by more than two-thirds. And thanks to better treatments, the number of people with HIV who survive has increased dramatically. 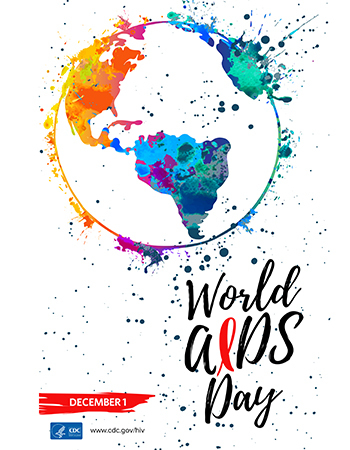 World AIDS Day has played a major role with its mission of educating people to prevent the spread of HIV, supporting those living with it and commemorating its victims. Despite this encouraging news, it’s estimated that over a million people in the U.S. have HIV – and one in seven don’t know it. More than 38,000 people were diagnosed with the virus last year. The theme for World AIDS Day this year is “Know your status.” While we’ve come a long way in three decades, knowing that crucial piece of information is as important as ever. For transmission to occur, these fluids must come into contact with a mucous membrane or damaged tissue, or be directly injected into the bloodstream. HIV progresses from an acute infection stage to a clinical latency stage, then to AIDS. Acute infection stage: This stage often includes severe flu-like symptoms. The risk of transmitting HIV is very high during this stage, but starting treatment can have significant long-term health benefits. For these reasons, people who experience these symptoms and think they might be infected with HIV should get tested and seek medical care. Clinical latency stage: During this stage, the virus is developing and has mild symptoms or none at all. People receiving the proper treatment can often live with HIV in this stage without AIDS ever developing. Those undergoing treatment also can lower their risk of or prevent transmitting HIV to sexual partners. AIDS: People who develop AIDS have damaged immune systems and are vulnerable to opportunistic infections. Treatment is still possible and can be lifesaving, but without it the prognosis is grim. These facts emphasize the need for people to find out if they have HIV. Those who have HIV not only should seek treatment, but also need to continue that treatment to keep the virus under control and from spreading. Prevention is important, but knowing your status and acting accordingly are also crucial. Here in Nebraska, the Nebraska AIDS Project (NAP) leads the community in the fight to overcome HIV/AIDS and its stigma through education, supportive services and advocacy. The organization is proud to be a part of World AIDS Day events across the state. As a former member of the NAP board, I know just how tirelessly we work every day to help stop the spread of HIV/AIDS, and I advocate for those living with it. Most importantly, the NAP urges those who believe they may have been exposed to HIV to get tested. NAP provides free, confidential and anonymous HIV testing and counseling for anyone 13 and older. Test results are available the same day. If you have questions or concerns about HIV/AIDS, don’t hesitate to speak with your Methodist Physicians Clinic primary care provider or contact the Nebraska AIDS Project at 402-552-9260. The Centers for Disease Control and Prevention as well as HIV.gov also have extensive resources. Together we can continue our success in the fight against HIV/AIDS. Published on Nov. 28, 2018.